As my grandparents and parents are getting older we are slowly starting to transition more into my role as their caregiver. Though no one wants to lose their independence. It's so important to start strategically transitioning into the role. I have many friends who waited until the last minute and/or their family member health took a turn for the worse unexpectedly, and they were perplexed about what to do and how to even approach their current circumstances. Below I'm sharing tips Four Tips on How To Transition Into A Caregiver. Though my grandmother, currently still lives on her own. I'm consistently communicating with her and ask questions. I know who her physicians are and where her important documents are. Several years ago I transitioned into paying her bills. I approached the matter by offering my services. I didn't wait until she was at her current age and waiting until the possibility of her health declining. I also started off with just helping her with one bill. The first bill that I started paying for her was her Sam's Club membership. Over time, she realized that I wasn't trying to take her independence away, that I was just trying to help her. We've even slowly started transitioning into automatic bill pay which now she adores. One of the things that I've worked on with my grandmother is creating a budget. What I love about this concept is that we have a monthly budgeting meeting. It's a fun time that we create to go over our budgets and discuss bills in which that need to be paid and upcoming items that we would like to purchase. This is perfect because I can first hand see what here monthly expenses are as well as her grocery budget and ways in which we can save. One of the places we love to shop at is Sam's Club. It's pretty much like a one-stop shop for us. She's able to pick up items like her medications to her Ensure® Plus Nutrition Shake drinks. We typically will go over the items that she needs and see if there are any offers in the Instant Savings Book. Shopping can be a daunting task for anyone. When I find out about new services I share them with my grandmother and show her how convenient they are to use. My grandmother has a love-hate relationship with going to the store. She has to be in the mood for it. For days that she's not, I offer services like Club Pickup and same day grocery delivery. What I love about these options is that she feels like the super cool grandmother who knows about the latest trends and brags to her friends about it. What I love about this is that in the event that she's not as mobile as she is now. We already utilize these options and she's not going to feel as if she's losing her independence. Start the communication now. Thought my grandmother and I have a wonderful relationship. I struggled with how to approach the topic about Depend Fit-Flex Underwear, Poise Liners, and pads. While at my grandmother house, I noticed that she was running low on Poise Pads. I also noticed that Sam's Club was running a sale with their Instant Savings Book. While we were at Sam's Club I placed a box of Poise Liners in our cart and shared with her the offer. Shortly thereafter she grabbed a box of Depend Fit-Flex Underwear, and we chatted about how my body hasn't been the same after having children and how one and how common bladder leakage is. She's too cute with the topic. I always have the Poise Liners in my purse to keep on hand. It's so cute because now we have matching "girls" bags as we like to refer to them that we keep inside of our purses which house all of our feminine care essentials. Watch My Video To See Why I love Sam's Club So Much! All of these tips are wonderful to incorporate as our parents get older. Wearing some under protection isn't such a big deal any more and they have improved them so much. I love the new scan and go! But I always feel sneaky just walking past everyone standing in line! LOL . Your Grandma is so lucky to have such an understanding granddaughter. And caregiving essentials have become sort of a hush hush topic. I wish more people were open about it, its just the way life goes. Like our bladders after having babies, it just happens! I don't think anything can be more difficult than be a care giver. But its one of the most important roles you can take. These are great tips. I do not think anyone is ever prepared for becoming a caregiver to their elderly parents or grandparents. It is the most important job you can do! It's an inevitable thing, our parents getting older. The more we discuss ideas and tips, the better equipped we'll be in taking care of them. Thanks for the great tips! As my parents are getting older being their caregiver is something that I will need to start thinking about and discussing with them. Caregiving can be so stressful. 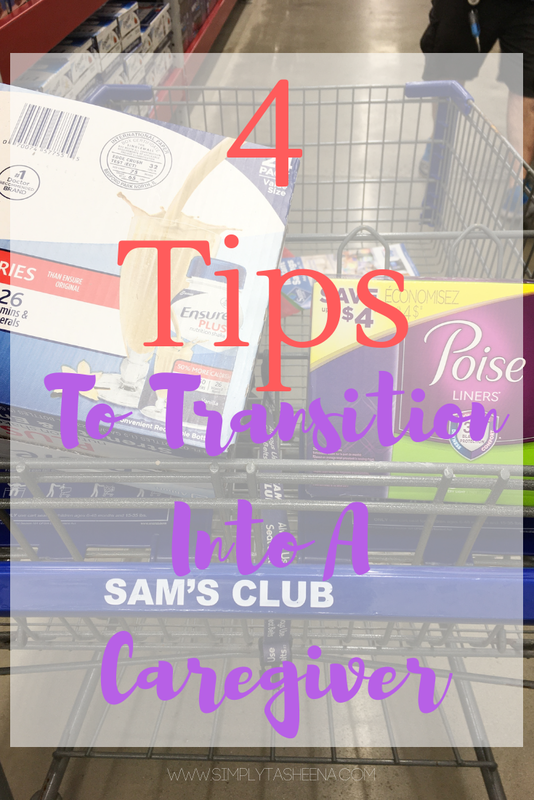 Thanks for providing so good tips to make the transition a bit easier. My mother-in-law has been caring for her dad for the better part of this year. It has been a toll on her, but she is honored to do it. Being a caregiver is such a big responsibility. It sounds like you have some some ways to make it easier. So nice that you are helping her out. Addressing the transition to caregiver well in advance is great. When there are needs to address, it can be emotional so tackling the topics early is going to be a big help to me. Saving is always important, too. So doing chores together like budgeting and hitting up Sam's Club helps. These are excellent tips! Being a caregiver is definitely not easy and takes a lot of love and patience. Luckily Sam's Club is there to help with all the essentials.